Definition at line 31 of file ARMRegisterBankInfo.h. Definition at line 132 of file ARMRegisterBankInfo.cpp. 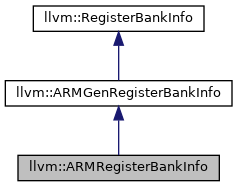 References assert(), llvm::ARM::checkPartialMappings(), llvm::ARM::checkValueMappings(), llvm::RegisterBank::covers(), llvm::RegisterBankInfo::getRegBank(), llvm::TargetRegisterInfo::getRegClass(), and llvm::RegisterBank::getSize(). This mapping should be the direct translation of MI. In other words, when MI is mapped with the returned mapping, only the register banks of the operands of MI need to be updated. In particular, neither the opcode nor the type of MI needs to be updated for this direct mapping. The target independent implementation gives a mapping based on the register classes for the target specific opcode. It uses the ID RegisterBankInfo::DefaultMappingID for that mapping. Make sure you do not use that ID for the alternative mapping for MI. See getInstrAlternativeMappings for the alternative mappings. For instance, if MI is a vector add, the mapping should not be a scalarization of the add. If returnedVal does not verify MI, this would probably mean that the target does not support that instruction. Definition at line 200 of file ARMRegisterBankInfo.cpp. References assert(), llvm::RegisterBankInfo::DefaultMappingID, llvm::ARM::DPR3OpsIdx, llvm::RegisterBankInfo::getInstrMappingImpl(), llvm::RegisterBankInfo::getInstructionMapping(), llvm::RegisterBankInfo::getInvalidInstructionMapping(), llvm::MachineInstr::getNumOperands(), llvm::MachineInstr::getOpcode(), llvm::MachineInstr::getOperand(), llvm::RegisterBankInfo::getOperandsMapping(), llvm::MachineBasicBlock::getParent(), llvm::MachineInstr::getParent(), llvm::MachineOperand::getReg(), llvm::MachineFunction::getRegInfo(), llvm::LLT::getSizeInBits(), llvm::MachineFunction::getSubtarget(), llvm::MachineRegisterInfo::getType(), llvm::ARM::GPR3OpsIdx, llvm::isPreISelGenericOpcode(), llvm::MachineOperand::isReg(), llvm::RegisterBankInfo::InstructionMapping::isValid(), MRI, Size, llvm::ARM::SPR3OpsIdx, and llvm::ARM::ValueMappings. RC is a user-defined register class (as opposed as one generated by TableGen). The mapping RC -> RegBank could be built while adding the coverage for the register banks. However, we do not do it, because, at least for now, we only need this information for register classes that are used in the description of instruction. In other words, there are just a handful of them and we do not want to waste space. Definition at line 171 of file ARMRegisterBankInfo.cpp. References llvm::ARM, llvm::TargetRegisterClass::getID(), llvm::RegisterBankInfo::getRegBank(), and llvm_unreachable.